KATHMANDU, July 15: Hike in ginger price was expected after India opened unhindered supply of Nepali fresh ginger effective from July 2. But price of this staple spice has seen a slight fall instead. The retail price of ginger was Rs 125 per kilogram when India announced to permit export of Nepali fresh ginger by removing the product from its restricted item list. The price in the week after the announcement has fallen to an average of Rs 116.5 per kilogram. The price reached to the Rs 125 mark only on one day over the week. Narahari Prasad Ghimire, chief of Prime Minister Agriculture Modernization Project, said that the flux in Nepal’s ginger prices is directly related to the amount of ginger being exported to India, the largest market of Nepali fresh ginger. “Ginger price increases naturally when the Indian market is open and decreases when there are problems exporting to India,” he said. Ghimire told Republica that the change in price of ginger in the market is not based on the quality of Nepali, but on the manipulation by Indian traders. Nevertheless, despite the slight fall in price, the current price compared to the average retail price of the last year during the corresponding period has increased by an average of Rs 55. The average price of ginger in Nepali market in the Nepali month of Ashadh last year was Rs 67 per kg, which has risen to Rs 122 this year. 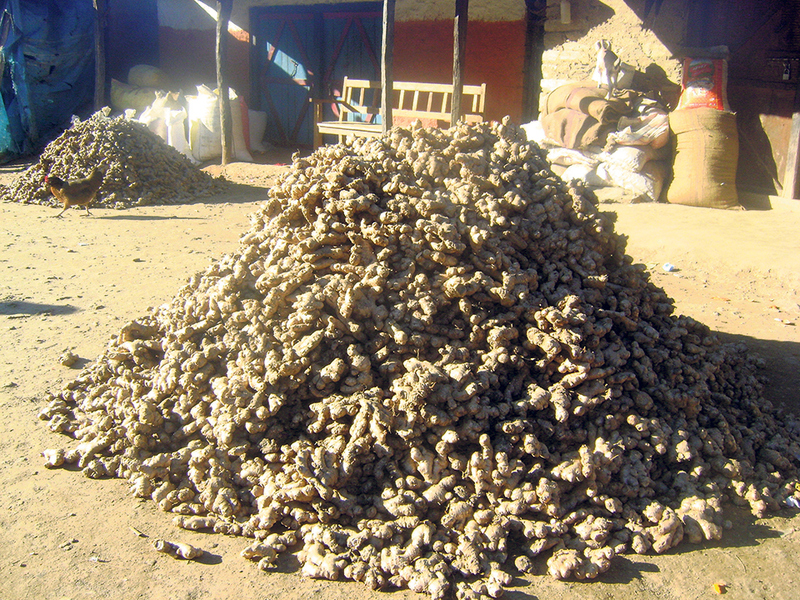 According to government officials, middlemen are responsible for the jump in average ginger price in the Nepali market. Ginger is also a source of earning foreign currency for the farmers. Nepal’s ginger export has been worth Rs 348.7 million, according to the statistics of Department of Customs in the first 11 month period of FY2017/18. The volume fluctuated over the period depending upon the temporary decisions made by Indian authorities. Though the bilateral trade agreements between Nepal and India allow free flow of agro products from both sides, non-tariff barriers from the Indian side halted Nepal’s fresh ginger export for some time. However, the Indian side has assured that it will allow export of Nepali ginger without any hindrance from now on. This product is also listed under the National Trade Integration Strategy (NTIS), through which Nepal aims to boost production and earn foreign currency as it is a competitive agro product. Experts however say there is no point to cheer with the news that India has allowed free flow of Nepali ginger. They say the country should focus on value addition in the product of ginger and explore possibility of exporting it to countries other than India.